In the heat of battle in the services industry’s rotation from labor arbitrage to digital, Genpact made a significant move today that signals to everyone it’s playing to win. Genpact announced it signed an agreement to acquire Rage Frameworks, a leader in enterprise Artificial Intelligence (AI) and automation technologies and services. Genpact moved the cheese. Three aspects of Genpact’s acquisition of Rage are especially significant. Serious Commitment: It’s apparent that Genpact recognizes the future of services will be digital. The global services industry is witnessing unprecedented deceleration. At Everest Group, we closely track the top 20 service providers. As illustrated in the chart below, the labor arbitrage-based businesses collectively stopped growing last year and 21 percent of the industry growth is now in businesses with a digital focus. Among the top 20 providers, growth for arbitrage-first providers actually shrank last year. As we look forward two more years, we think it will further decelerate and go to just under two percent.Accenture has rotated into digital faster than other providers, and already has the highest percentage of work in digital. It’s the biggest and is blowing other providers away. Of note, it’s the only provider that has succeeded in growing its margin while moving into digital. As I’ve recently blogged about the dilemmas at Infosys and Cognizant, for example, the rotation into digital stresses providers’ margins. The faster they grow in digital, the lower their margins are, which is very inconvenient.“Change is inevitable, but growth is optional,” wrote John C. Maxwell, leadership expert and best-selling author. With its Rage acquisition, Genpact bypasses the dilemma other providers are facing and demonstrates its seriousness and its commitment to growth in the digital space. Accelerating clients’ digital transformation: Everest Group’s research group conducted a study of 132 “best reference” clients of top service providers. Our study found 48 percent of clients are unhappy and 25 percent are very unhappy. A top reason for their dissatisfaction is providers’ capability of helping them with a digital restructure.Rage Frameworks presents an exciting set of technologies that are immediately applicable to Genpact’s existing client base. Leveraging Rage’s no-code development AI platform in cognitive computing, enterprises can gain real-time insights for mission-critical functions, simplify automation, manage risks better and gain competitive advantages. For the last 18 months, Genpact and Rage successfully partnered on strategic client digital engagements including a large global insurer, a global consumer packaged goods leader and several large financial institutions. Their combined capabilities will help clients drive digital transformation at scale and accelerate clients’ digital journey. Rebranding: The Rage acquisition also enables Genpact to rebrand itself as a digital company in the broader marketplace, not just an arbitrage service provider. Moreover, the AI capability is quickly becoming mainstream for leading enterprises as it enables organizations to change the way work is done and enhance their value proposition and competitive advantage. When an arbitrage company such as Genpact thinks about its rotation into digital, it must focus on managing three constituencies: shareholders, internal constituencies and customers. It signals to the shareholders that Genpact is serious about rotating into digital, and it’s joining companies like Accenture, which is the leader of rotation into digital. It equips Genpact’s internal organization with the tools and intellectual property to drive the provider’s transformation into a digital services leader. It helps reposition Genpact with its customer base in Artificial Intelligence and cognitive computing – a very important and quickly growing emphasis in digital capability. Genpact’s bold move is important to watch. How many other arbitrage providers will follow this path of serious investment to accelerate their journey to become digital-first service providers? The general insurance (GI) industry has largely remained silent in a world where conversations either begin or end with the word “digital.” Products and services from the traditional GI providers have failed to keep tempo with the rapid technological developments happening everywhere else. One reason for this is that GI offerings are low-touch products about which customers interact with the provider just once or twice a year. Another is that GI providers have traditionally not focused on customer experience or value generation for their clients. They lag the Ubers and Amazons of the world by many miles. However, the landscape has started to change recently due to the entry of disruptive start-ups trying to bridge the gap between service delivery and customer expectations. Areas gaining traction include price comparison services and mobile-based services. The real standout is peer-to-peer (P2P) insurance. It has gained more market buzz because the business model is not as opaque as the traditional model and provides clear benefits for the customers. P2P insurance is a novel model facilitated by social media. Customers form their own online networks, and each pools in money to build a corpus. They allocate some portion of the fund to the mutual pool and pay the balance to a traditional insurer. When a claim must be made, members pull money from the mutual pool. If a claim exceeds the mutual pool corpus, they approach the reinsurer. If the claim is less than in the mutual pool, the remaining amount is distributed back to the members. Unclaimed insurance premiums are profits for traditional insurers. However, P2P insurance gives unclaimed money back to the members. How does this disrupt the status-quo? In the medium to long term, as this model gains maturity and acceptance, customers may switch to the P2P model. This will shrink the market share held by traditional players. Reduced demand for traditional insurance plans, coupled with increased supply, will drive down prices. Thus, customers are likely to benefit in the end. Who are the current prominent P2P start-ups? These companies are the hot start-ups in this space for a number of reasons. First, they are the early movers that have leveraged cutting-edge technology tenets such as social media and mobility. Second, they are trying to tackle a real business problem and, in the process, are improving efficiency in the market. Finally, they are managing to raise substantial funding from prominent investors such as Sequoia Capital and Horizons Ventures. An urge for innovation in the industry, coupled with high potential demand from the customers, will drive further disruptions in the GI market. Start-ups are likely to be the vanguard in this evolution, by introducing value generating products and services. Sooner than later, the traditional players will wake up to the new normal, and will try to catch up by either acquiring these start-ups or partnering with them. Ultimately, the end-customers will be the beneficiaries, as competition forces the prices down and innovation drives the quality of services up. Whether your company is a service provider or a consumer of business services, you’ll see dramatic change in 2017. This is our 25th anniversary at Everest Group, and reviewing the past 25 years of the services industry got me thinking about where services are taking businesses for the next few years. I’ve seen substantial changes in 25 years, and we’re about to see change again – but in a bigger, more profound way. I view the services industry through the lens of what a “service” is. It’s the exchange of value – value deemed significant enough that the buyer is willing to pay for that service. The first services disruption over the past 25 years was in the asset-intensive IT infrastructure space. In 1991 when I founded Everest Group after I left EDS, the service provider landscape was dominated by ACS, Capgemini, CSC, EDS, and IBM. These infrastructure providers delivered value primarily as operational excellence. The key leverage point in the operational excellence model was economies of scale. Our value proposition at Everest Group at that time was that we understood the operational excellence model – where to apply it, how to select a provider, how to define the services, how to negotiate an equitable contract and how to measure the results. I wrote a book, “Turning Lead Into Gold: The Demystification of Outsourcing,” published in 2000, which laid out this information. At that time, we at Everest Group were working with a client that was a large energy company, which moved its work to a service provider in India. We started to see the emergence of a radical new way of delivering services by moving U.S. and European work offshore. The key leverage point in this second services disruption was talent pools in lower-cost locations. Then came Y2K, which catapulted India’s talent resources into prominence because the U.S. lacked necessary resources to remediate computer systems for the new century. This further validated using offshore resources and the labor arbitrage model. Yes, the providers delivering operational excellence achieved impressive results in delivering value for their customers. But the labor arbitrage model delivered greater value. Then we saw companies taking advantage of business process outsourcing (BPO) services, leveraging low-cost talent. 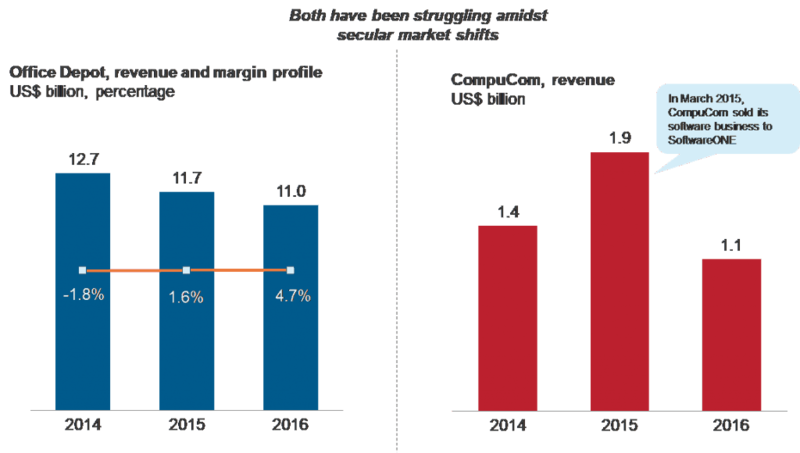 BPO and the labor arbitrage market exploded with growth. New challenges arose. Mature buyers of BPO services needed to evolve their outsourcing strategies and realized a decreasing capability of internal purchasing organizations to buy and measure outsourcing services effectively. Service providers wanted to provide wider, deeper offerings. At Everest Group, we opened a new research group to provide more data and perspectives to assist mature buyers, and we reached out to providers to help them with their expansion growth agendas. We worked with providers using the labor arbitrage model as they started experimenting with how to add more value as the labor arbitrage space matured over the past few years. Providers experimented with some early automation and analytics offerings that enabled customers to do work even better, faster and cheaper than before. That brings us to today and the major disruption we’ll experience in 2017 and beyond. Now in 2016 it feels like a similar place to where we’ve been in the past – where we were with Y2K, on the cusp of explosive growth in delivering a disruptive model for business services. But today there is no external catapult like Y2K driving businesses to adopt a new model. Instead, there are disruptive digital technologies such as automation, analytics, cloud and cognitive computing. Services based on digital technologies will deliver value even more powerful than the labor arbitrage model. How much value? Ultimately it will depend on changes in business and service models accompanying the digital technologies. Viewing this new disruption again through the lens of value, here is my assessment for both sides of the services market – customers and providers. The services market will change even more dramatically in the coming years than what we saw in the two disruptive models over the past 25 years. We’ll see a lot of companies redefining value and changing models to deliver powerful new value. There will be a lot of service providers and customers going back to the drawing board, getting creative with opening new opportunities for greater value. Get ready for profound change! After a long, drawn-out, and scrutinized sale process, Verizon is acquiring Yahoo’s core operating business for ~US$4.83 billion in cash, marking a tumultuous fall for the once-iconic Internet giant, which once had a market capitalization exceeding US$125 billion. Verizon’s purchase includes “core” Yahoo, which spans search, email, advertising products, and the media business, including Yahoo Finance. It does not include Yahoo’s ~ 3,000 patents with an estimated value of over US$1 billion, which reportedly are being hived off through a parallel auction process. Beating out competing bids from a range of probables such as Advent International Inc., AT&T, Bain Capital, TPG, and Vista Equity Partners, the deal adds an important dimension to Verizon’s burgeoning digital media and advertising business, building on its 2015, US$4.4 billion acquisition of AOL. Not surprisingly, numerous digital revolution themes are reflected in this deal. The pace of disruption is unprecedented: We are increasingly witnessing companies achieving meteoric status, then being forgotten. While the demise of Blockbuster, Kodak, and RadioShack can be attributed to the innovators’ dilemma, fundamentally new technologies and consumption require companies to master the art of reinvention. Akin to running on a treadmill with a continually increasing pace or incline, being the poster child of one technology wave, even the Internet, is no guarantee of future relevance if you don’t reinvent and respond nimbly to market changes. Looking back at the history of the modern enterprise, there are only a handful of firms – think GE and IBM – that have reinvented themselves and continue to be relevant today. Verizon is prepping its arsenal as it looks to battle against the likes of Amazon, Facebook, Google, and Netflix for the fickle attention of an increasingly mobile consumer. It has made meaningful moves, but integrating AOL and Yahoo into its broader digital content and advertising narrative will be crucial for these bets to pay off. Time-to-value is experiencing exponential contraction: The lifetime of technology companies (and enterprises in general) has shortened drastically. This has fundamental implications for business strategy, as modern leaders don’t have the luxury of time in the wake of quarterly Street expectations, fickle investors, intense competition, and extreme scrutiny. Companies need to stop overthinking about the long term, and instead focus on meeting shorter hurdles. There’s no longer room or relevance for a five-year horizon, as there’s no saying what the next wave of technology onslaught is going to be. The law of gravity catches up: Yahoo, despite being ubiquitous during its heyday, is still a relatively young company born in 1995. Its downfall was hastened by the likes of Facebook and Google eating up the advertising pie. As the volume, variety, and velocity of competition keeps increasing, we may need to redefine the definition of long-term. For example, the common thread among Airbnb, Dropbox, Fitbit, Instagram, Pinterest, Slack, Snapchat, Spotify, Tumblr, Twitter, and Uber is that all are billion dollar companies (Unicorns) that didn’t exist 10 years ago. Yet, other than Salesforce – which started in 1999 and now has a market cap of over US$50 billion – most technology companies have failed to meaningfully scale, and have died a slow death or been acquired by a bigger fish. Tactical re-engineering can only get you so far : Yahoo failed to adequately respond to challenges in its core business, and once caught off-guard, it responded with successive leadership changes (Marissa Mayer is its fifth CEO since 2009), employee layoffs (Mayer culled nearly 15 percent of the total workforce), and overvalued acquisitions made out of desperation (it bought ~58 firms since 2009, including Tumblr for US1.1 billion in 2013). None of these moves dramatically changed its fortunes, as they only tangentially addressed its core travails. Companies lacking a “real” asset will always be at risk. Yahoo, like Microsoft to a certain extent, missed the bus on social, mobile, and cloud. While Microsoft has belatedly begun to make amends under Satya Nadella, Yahoo remained stuck in a bygone era, underscoring the importance of looking out for future trends and placing bets early. Going forward, we expect other marquee tech companies to also face the heat, whether it’s Apple trying to tackle plateauing iPhone sales, and perhaps pivoting to a rising enterprise business, Facebook/Google endeavoring to increasingly monetize their saturating mobile advertising moats, or Twitter attempting to answer its user acquisition dilemma. The future is uncertain, and there are no longer clear winners in the digital era.